May Arts carries a wide assortment of ribbon for the jewelry industry. Looking for a ribbon to gift wrap? Try our reversible satin or an iridescent sheer. 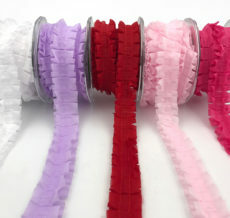 With metallic, grosgrain, chenille, stripes & dotted ribbons, there is something for any occasion.